18 April 2019: Abdelhak Bentaleb was selected for the 7th Heidelberg Laureate Forum 2019. He is among the 200 young researchers across the world who will have an opportunity to meet laureates of CS and Mathematics, i.e., ACM A. M. Turing Award, Abel Prize, Fields Medal and Rolf Nevanlinna Prize winners. Congratulations! 1 March 2019: Our lab has launched a new research project entitled "Learning Multimodal Deep Features for Weakly Labelled Sound Event Detection." This research is supported by Singapore Ministry of Education Academic Research Fund Tier 1 under MOE's official grant number T1 251RES1820. 30 January 2019: Atlastream from our research lab is one of the startups participating in and funded under the NUS Graduate Research Innovation Program (GRIP). NUS announced the program and its inaugural group of selected startups in the following news announcement "NUS invests $1.5m in 15 deep-tech start-ups." 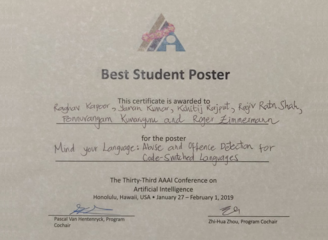 1 February 2019: The team of Raghav Kapoor, Yaman Kumar, Kshitij Rajput, Rajiv Ratn Shah, Ponnuvangam Kumaruguru and Roger Zimmermann received the Best Student Poster at the Thirty-Third AAAI Conference on Artificial Intelligence (AAAI 2019) for their work entitled "Mind Your Language: Abuse and Offence Detection for Code-Switched Languages." 30 January 2019: Our lab is participating in a newly approved research project entitled "Learning Generative and Parameterized Interactive Sequence Models with RNNs" funded by the Ministry of Education (MOE) under their AcRF Tier 2 Grant Calls.